Technologies utilized in the lunar probe mission can also be used for civilian purposes, including cutting smog, producing a type of sugar alcohol and researching self-driving vehicles, Chinese experts said. The lunar probe mission may sound far from people's daily lives, but Chinese scientists disagree. 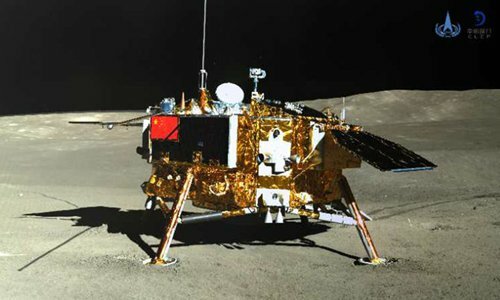 "Many things we are very familiar with in daily life such as air-shockproof shoes, dried vegetables and xylitol come from the lunar probe missions," Pang Zhihao, a Beijing-based space communications expert, told the Global Times on Thursday. Pang added that the technology of the lunar exploration project can also help treat air pollution. "The rocket engine needs to burn through huge quantities of fuel to push Chang'e-3 into space. The burning technology can be used on engines of cars and combustion furnaces to eliminate harmful gases," he said. Fumes from chemical plants contain sulfur and saltpeter, which are the primary sources of air pollution. As Pang said, combustion furnaces using the burning technology to mix fuels can control the emission of hazardous substances by recycling sulfur or removing saltpeter. Song Zhongping, a military expert and TV commentator, told the Global Times on Thursday that burning technology relies on the high temperature of the rocket engine that can thoroughly burn harmful gases, which has been utilized in waste treatment plants. Song said that the automatic control equipment to avoid barriers that Chang'e-4 used to land on the moon plays a significant role in the hostile environment and helps the lunar lander descend smoothly. "The equipment can apply to automatic driving vehicles such as self-driving cars and drones," he noted. Song said the solar cell of spacecraft can also be used for civilian purposes by allowing civilian solar cells to work under low light. "Space technologies are high-grade, precise and advanced," Song said, noting however, it is difficult to use them for civilian purposes in the near future because of their high cost. A cotton seed carried to the moon by China's Chang'e-4 probe sprouted on the moon on Tuesday after the probe made the first-ever soft landing on the far side of the moon.